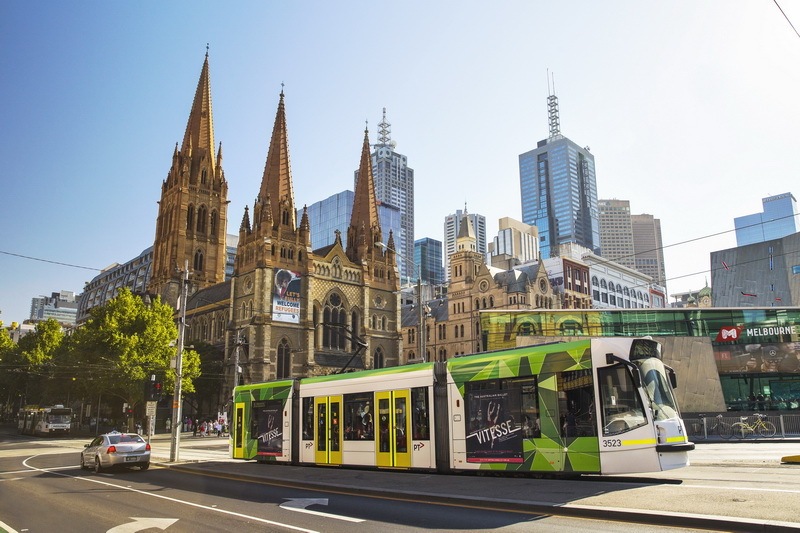 Melbourne is an easy and inexpensive city to get around, with the metropolitan area servicing a great network of public transport, roadways and walking paths. This useful information will make moving around Melbourne’s different areas and attractions very simple. Our tip: travel like a local and save yourself some money by using the free city tram services. Public transport is heavily used in Australia by locals, commuters and visitors alike. To use public transport outside of the free tram zone in Melbourne, you need to purchase a myki card (which costs $6 plus travel fares). You can purchase a myki card from retail outlets displaying the myki sign, visitor centres, and at train stations. Initially you’ll need to load it with some money to cover your fares. You can top it up at convenience stores and train stations as your balance runs low. To start your ride, tap your card on the reader when you board your selected mode of transport and be sure to tap off when you disembark. Take advantage of the Free Tram Zone that operates in Melbourne city centre. If your travel is within the free zone you don’t need to tap on or off with your myki card. The City Circle Tram (number 35) is a great introduction to Melbourne with city loop services running every 12 minutes. The entire circuit takes about 48 minutes and provides historical commentary if you listen carefully. This hop on/hop off service links with other bus and train routes, and passes major attractions stopping on Flinders Street, at Federation Square, the Harbour Esplanade, Docklands and Queen Victoria Market. And best of all, it doesn't cost a cent. Melbourne has an excellent tram service that operates through the inner suburbs. The routes run in two zones, with the cost using your myki card calculated according to the zones you travel in. Most trams operate only within zone one, and sometimes the zones will overlap depending where you are traveling. The trams also run to other Metropolitan areas including St Kilda Beach, the arts district of Fitzroy and the popular shopping and dining district of Chapel Street in South Yarra and Prahan. For more information on the tram network, visit Public Transport Victoria. The trains are a great way to visit attractions across the city and reach the surrounding suburbs, with services running daily from early morning to late at night. Major stations in the city include Central, Flinders and the newly refurbished Southern Cross Station. Catch the train to reach attractions including Melbourne Aquarium, Etihad Stadium, and a range of destinations including South Yarra and Brighton via the Sandringham Line, Richmond and St Kilda via the South Morang & Hurstbridge Line. Trains to regional destinations including Geelong, Ballarat, Bendigo, Seymore and Albury, operate on the V/Lineservices. You can use your myki card on all train networks. The bus network is another efficient way of hopping around metro Melbourne and popular neighbourhoods. To reach Fitzroy by bus from the city, catch the 200 and 207 buses, Collingwood on the 302, 303, 305 and 318, and South Yarra and Prahan on the 216, 219, 220 services. The night bus network operates Fridays and Saturdays, running every thirty minutes and stopping at six locations around the city centre. If you are feeling a little more adventurous, try Melbourne’s bike share service which starts from $3 a day. There are some great tracks around the city and along the Yarra River to explore. You can use taxis or rideshare to get to and from Melbourne airport. For a convenient option, catch the SkyBusexpress service that runs 24 hours a day, stopping at terminals one, three and four. SkyBus also operate a service to and from Avalon Airport. Both airport services stop at Southern Cross Station on Spencer Street in the city. Note that the SkyBus services do not accept myki cards, and tickets are purchased either online or at the airport. You can access taxis and rideshare services when you arrive. The Melbourne CBD is a short, 20-35 minute ride away and will cost about $56-$62 one way. You'll find taxi ranks at the front of all terminals - simply follow the signs to the nearest ranks. Find out more on rideshare services and hire car options. In Australia, airlines, trains, buses and ferries have accessible options for people using a wheelchair or mobility device. Melbourne Airport provides special assistance for people with disabilities and can help with baggage, getting around the airport, and getting on and off the plane. The majority of buses and trains have accessible options - check the Public Transport Victoria website for information on using public transport before your trip.